Welcome to Pipe Babes 2012! To see the archives of Pipe Babes from 2009 - 2011, look here. Gabrielle is smoking 2002 G.L. Pease Haddo's Delight that was just opened for this shoot. Her pipe is a Willmer AAA straight grain. We decided to have fun with her hair and make-up doing a retro-pin-up style. The shoot was done at McNulty Lofts in downtown St. Petersburg, Florida by Steven Kovich. We really enjoy being creative here at PipesMagazine.com. Chelsea came up with the idea of doing a shoot with a Film Noir look to it. She did a great job on hair, make-up and wardrobe. The photographer for the shoot was Joshua Ford, and he did an excellent job with the set and lighting to create a great Film Noir style. We hope you enjoy viewing the photos as much as we did producing them. Gabrielle is looking chic and metropolitan in this shoot done in a downtown luxury condo in St. Petersburg, Florida. She is smoking a half-bent freehand Poul Winslow C-grade Pipe with silver band. Her tobacco of choice is Hamborger Veermaster. Chelsea is smoking Captain Black Round Taste. This is the new name for what used to be known as Captain Black Light. The word "Light" has been restricted in world markets as a descriptor for tobacco, so all brands are discontinuing the use of Light in their names. It is still the same great pipe tobacco. Lane Limited describes Captain Black Round Taste as "A mellower variant of Captain Black that results in a smooth, mellow and bite-free smoke." It is a loose cut consisting of "Golden Virginias with a touch of mellow Burleys and a hint of Oriental tobaccos." 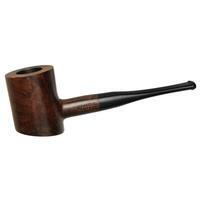 Chelsea is smoking Captain Black Round Taste in a Full Bent Apple Meerschaum Pipe from her personal collection. This photo shoot is sponsored by Lane Limited (a division of Scandinavian Tobacco Group) and Captain Black Pipe Tobacco. Gabrielle makes her debut as a "Pipe Babe" smoking 11-year old original Bell's Three Nuns. She is looking pretty and sophisticated with her hair pulled back with a smart and fashionable ensemble of a red skirt, white top, and black boots. She is enjoying her tobacco in a Ferndown 3 Bark Paneled Dublin with Silver band and saddle bit. Chelsea is smoking Captain Black Royal. The Royal version of Captain Black consists of Aromatic Black Cavendish and Gold Cavendish. According to this Captain Black Tobacco Review; "Captain Black Royal is slightly toned-down on the sweetness, great for smoking all day." Last weekend was Chelsea's birthday, and she celebrated with some good drinks and smokes. She is smoking Captain Black Cherry pipe tobacco. It is a Cavendish blend with a cherry flavor - "Exceptionally Mild, Delightfully Aromatic". This photo shoot makes us both happy and sad. We're happy that this is the most beautiful and elegant shoot ever done by Cynthia for Pipes Magazine. We are sad because it may be the last. She has just graduated college and will soon be starting her career in the film industry. We even had to cancel a new shoot that was to happen this month as it didn't fit Cynthia's schedule. The pipe Cynthia is smoking is from the Aaron Spelling Estate, and from the personal collection of Pipes Magazine Publisher, Kevin Godbee. 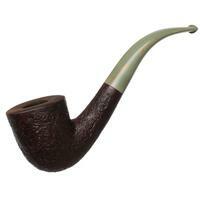 It is a 1961 Root Briar in the classic Dublin shape. Kevin has vowed to never clean the bit of this Dunhill again. Spring has sprung in "Pipe Babe Land", and we decided to celebrate out in the American Heartland. What better place is there to smoke a Corn Cob Pipe than in the Corn Belt of Iowa? 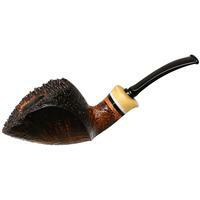 Chelsea is smoking a Missouri Meerschaum Legend Corn Cob Pipe. This photo shoot is sponsored by the Missouri Meerschaum Company - The Original and Only Manufacturer of Missouri Meerschaum Corn Cob Pipes. Thanks to Rick Newcombe, pipe collector, and author of the book In Search of Pipe Dreams, for loaning us his pipe in the prince shape, which was made in the 1940s or 50s by the famous French department store Hermes. The pipe was not actually made by the department store. They probably commissioned pipes to be made by pipe makers in St. Claude, France that were stamped with the Hermes name. Rick tells us; "I bought this pipe unsmoked years ago at a pipe show from Steve and Roswitha Anderson of S&R Woodcrafts of Ohio." This is an amazing shoot. I love the bricks, the lighting, Chelsea's amazing blue eyes, auburn hair, her lacy, silky black dress and red topcoat all combine to make this shoot a feast for the eyes. 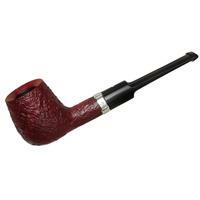 Chelsea is smoking a Savinelli Baronet Bruyere (316 EX). Here's an exquisite photo shoot of our sumptuous blonde, blue-eyed Pipe Babe, Violet. She is enjoying smoking G.L. 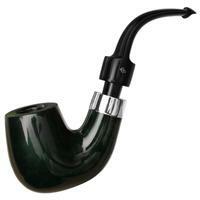 Pease Union Square in her Stanwell Hans Christian Andersen VI Sandblasted Pipe.